There is more than one artist with this name: 1) A Canadian thrash metal band. 2) A grime/garage MC from the UK. 3) A German hard techno artist. 4) A thrash metal band from Argentina. 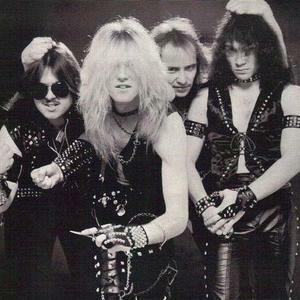 1) Razor is a Canadian speed/thrash metal band formed in 1984 at Guelph, Ontario. The group shot music videos for songs such as "Evil Invaders", "Shotgun Justice", "American Luck" and "Sucker for Punishment". The band dissolved in 1992, but reformed in the late 1990's to record another album, titled "Decibels", in 1997. 1) A Canadian thrash metal band. 4) A thrash metal band from Argentina. 1) Razor is a Canadian speed/thrash metal band formed in 1984 at Guelph, Ontario. The group shot music videos for songs such as "Evil Invaders", "Shotgun Justice", "American Luck" and "Sucker for Punishment". The band dissolved in 1992, but reformed in the late 1990's to record another album, titled "Decibels", in 1997. The band dissolved again, and reformed in 2005, and are currently planning to record another studio album. They were featured on the 2005 "The Gates of Hell Tour". In the United States and Canada they have toured with well known acts such as Slayer, Mot&ouml;rhead and Venom. Guitarist and primary lyricist Dave Carlo has been the only permanent member in the band's 20-year history. 2) Razor is a grime/garage MC from the UK. He has been releasing music as an independent artist since 2005. 3) Razor is a German hard techno artist, Christian K?lbl,currenty in collabration with Abstract. 4) Razor is a thrash metal band from Argentina.